LV Premier counts nearly 40 properties in Lisbon and Porto from studio to six bedroom apartments, and includes 2 seaside villas. All are fully equipped, have AC and heating and come with our signature LV Premier beds with 100% cotton ironed linen, plush towels, and premium toiletries. 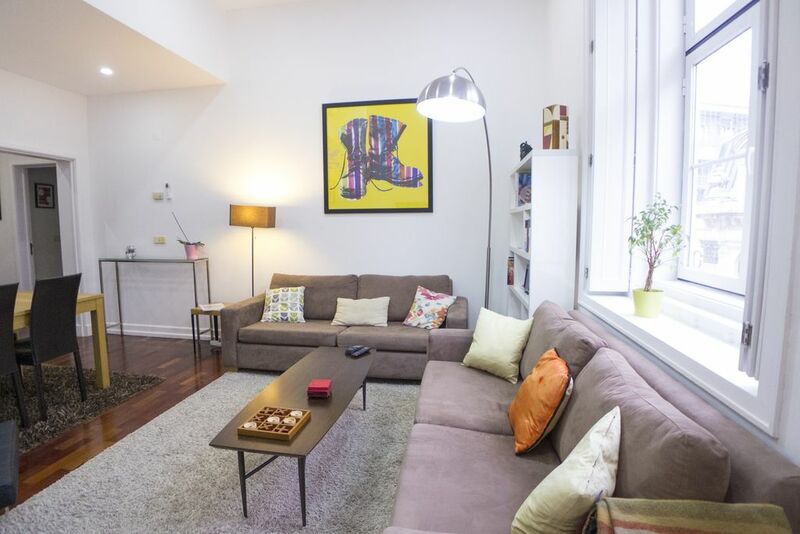 This gorgeous apartment is ideally situated in the Chiado/ Baixa district, enabling you the discover the city on foot. Should you want to venture further you can get the trains to Sintra and Cascais within 5-10 min walk. There are 3 subway/ metro stations within minutes. We have a fabulous balcony with river views. All bedding and towels are of super high quality (luxurious fiber duvets/ Egyptian cotton). Wonderful apartment centrally located in the heart of the city. We arrived late and were warmly greeted and shown around the apartment. Three couples were traveling Europe and the rooms were made up with queen beds in each. We also had a very early departure and she met us at the appartment and kindly made arrangements for a driver to take us to the airport. Our group originally had reservations at a luxury hotel which we benefited in canceling and staying at the apartment. You can't go wrong in staying here. Great Apartment, Great Location. The apartment was clean, spacious and comfortable. It is hard to imagine a better location. Check -in was well organized and lovely. No complaints-would stay here again in a heart beat! A lovely and extremely clean and well kept apartment in the best possible location in Lisbon. It's right in the middle of the city so you're so close to absolutely everything you could need. The apartment itself had more than enough room and amenities for all 9 of us. Would definitely recommend to a big group of travellers, though the noise of the city centre can be difficult at times, the location makes up for it. Host was also very accommodating throughout. Perfect, central location. Nice unit. We loved our stay in Lisbon and would definitely return to the same unit. It is in the central neighborhood of Biaxa easy walking distance to Alfama and Barrio Alto as well as to public transportation and the trolley lines. It was nice to have all the amenities of home instead of staying at a hotel. No shortage of places to eat if you don't care to avail yourself of the units kitchen. Occasional street entertainment right outside the door added to the fun. We were two couples traveling together and Lisbon was a highlight. Had a very pleasant and enjoyable trip. We had difficulty getting into the apartment after a long train ride from the south but Jose and his assistant were extremely helpful. Great location, convenient. I would suggest the light in the master be removed because at night it is a nuisance as the blue light hits from air conditioner. Overall fabulous trip and lisbon is a wonderful vacation. Would highly recommend. They had basic amenities on arrival like coffee so you don't have to rush out. restaurants are plenty nearby, metro is so close, shopping is too close!!! we would visit again. Fantastic location in city centre. Walk to Praça da Figueira, and the geographical centre of the city in less than 10 minutes. The Castelo de São Jorge is also within easy reach. The charming church of Anjos in nearby, as is the new seat of the city council in the newly refurbished Largo do Intendente. Numerous activities in the vicinity. This vacation apartment is in close proximity of most historic sights in Lisbon- you can discover the city mostly on foot or using the metro stop right in front of the building. Walk up the hill to visit the fabulous views points in Miradouro da Graça and Senhora do Monte, and enjoy discovering the real Lisbon. There are trams nearby, and you can catch the famous 28 tram nearby. The Praça Comercio/Praça Figueira/ Rossio all within 10-15 min leisurely walk. The Bairro Alto can also be reached by foot (about 30 min). Why not try the beaches/ fishing village of Cascais ? Catch the metro and hop on the train in Cais do Sodre. Or head to lovely Sintra - reachable via the Rossio train station. There are a number of restaurants and shops right outside. If you want o exercise you can head to the river to Praca do Comercio, and heading west on the river front. You can run as far as Algés, enjoying views of the river, bridge, Mosteiro dos Jerónimos and the famous Torre de Belém.